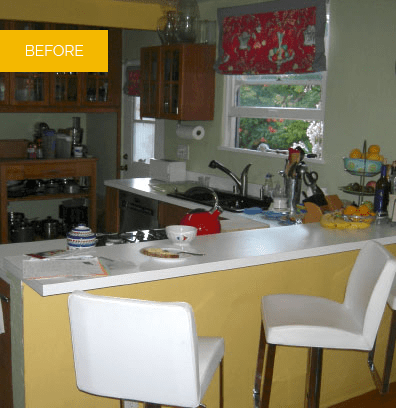 A creative couple wanted a new kitchen with modern functionality that honored the original character of their 1920s Spanish-style home. They wanted the kitchen to stimulate their senses, express their diverse cultural interests and embody their independent spirits. 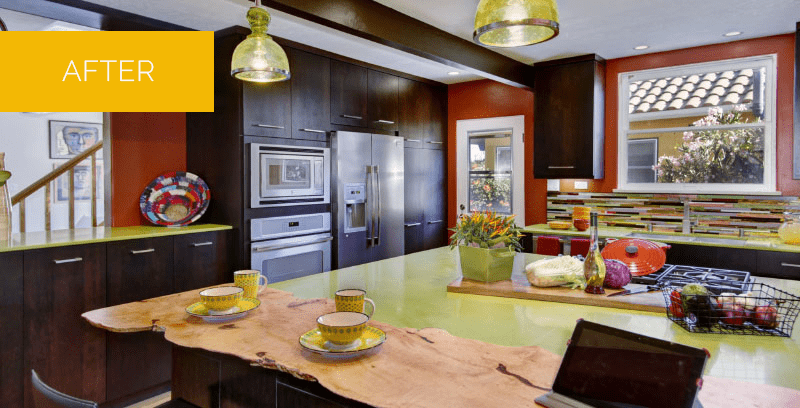 An unusually large island was created as a centerpiece unifying unexpected materials, bold colors and modern style, along with practical functionality. Space planning visually connects the kitchen with the rest of the home, creating an open line of sight from the back to the front and suffusing the area in natural light. A medley of accessories such as a glass chandelier and patterned plates were carefully selected to express the clients’ interests. A new beam was added to pair with an existing beam as a balancing architectural element. Cabinets in darkly stained cherry wood against vibrant walls create exciting visual depth and richness in a kitchen that artfully integrates eclectic elements.